As the weather improves, both private citizens and business owners have to adapt to changes that the higher temperatures will bring to the state. Some are quicker than others, especially when it comes to public areas and businesses, and every year accidents result from this lack of foresight. If you are injured due to a slip or trip on someone else’s premises, you may be entitled to compensation for your injuries. While most people associate injuries from falls with the elderly, and it does disproportionately affect those over age 65, it can happen to anyone. Data from Florida’s Department of Health shows that unintentional falls are the leading cause of non-fatal, injury-related hospital admissions, and are the fourth leading cause of death from sudden injury across all age groups. The economic costs are also significant, especially among Medicare and Medicaid patients. While there is no data available based on time of year, it is reasonable to assume that changes in one’s environment would affect both the rate of injury and the rate of falling death, not least of all because some causes of slip and fall accidents are directly tied to weather patterns and temperatures. For example, a business neglecting to ensure that floors are either kept dry or that warnings about slipping hazards are posted during a spring rainstorm would likely be found liable for a customer’s injury in many situations, because there is a duty of care owed by the owner and operator of a business to its customers. 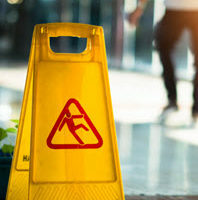 It is important to keep in mind that more than one cause of slip and fall accidents exists, and because of the way Florida’s law is worded, this may cause ambiguity in some cases. The statute that is most often cited in slip and fall cases is titled “Premises liability for transitory foreign substances in a business establishment.” However, this statute clearly does not address the fact patterns that may occur in certain cases. What if you slip and fall on your neighbor’s kitchen floor? What if you slip on a business establishment’s outdoor patio, which is tiled improperly or with flooring not designed to be used in such a manner? Generally, in situations such as these, common law authority or what is called premises liability law will control, if there is no statutory authority. At common law, a business owner or landowner has the obligation to make their property reasonably safe for those who enter upon it, though the specifics of that obligation will differ depending on the class of person (trespassers are owed only the duty to refrain from actively harming them, for example). If you slip on improperly installed flooring or due to some other cause that is not a ‘transitory foreign substance,’ it is likely that common law will control here. The law behind slip and fall accidents is more complex than it appears, and if you are injured in this way, it can feel like the literal rug is being pulled out from under you. If you have been in a slip and fall accident, the skilled Orlando personal injury attorneys at the Hornsby Law Group are happy to try and help you receive the appropriate compensation for your injuries. Contact us today to set up an initial appointment.